TL;DR: In this tutorial, we'll see how easy it is to build a native desktop C# app and get up and running with JWT authentication. If you're unfamiliar with JWT(JSON Web Token), you can read more about it here. Check out the repo to get the code. There are different frameworks for building native desktop C# apps. We have WPF (Windows Presentation Foundation) and Universal Windows. Universal Windows apps enable you to target every Windows device in one solution. You develop once, share most of your code, and deploy on Windows, Windows Phone, or Xbox. It reduces the effort needed in building and maintaining an app for each type of device. The limitation of Universal Windows right now is that it only works from Windows 8 and above. Meanwhile, WPF has been around for a very long time. It was introduced with .NET Framework 3.0. It uses Direct3D rendering which employs graphics cards to render the output on the screen. Thus the drawing in the form will be smooth and also there is a chance to utilize the hardware capabilities installed in your machine. WPF controls are actually drawn over the screen, and hence you can customize controls totally and modify their behavior when required. We'll be building the desktop app with WPF (Windows Presentation Foundation) using Visual Studio 2015 and .NET Framework 4.6.1. Open your Visual Studio. You can download from here. Create a new project and choose "WPF Application" as the project type. Under Templates at the left hand side, select Visual C# and in the middle panel, select WPF Application. Choose a folder for your project and give it a name. Then press "OK". Two files are created by default. One is the XAML file (MainWindow.xaml) and the other one is the CS file (MainWindow.xaml.cs). In a WPF application, there are two ways to design a UI for your application. One is to simply drag and drop UI elements from the toolbox to the design window. The second way is to design your UI by writing XAML tags for UI elements. Visual Studio handles XAML tags when drag and drop feature is used for UI designing. Take a good look at the Frame control and the Source attribute. I have linked the source attribute to another page. So, go ahead and create a directory called Pages. Right click on the folder. Click the add menu item and select page. Call it LoginPage. Now, this means when you run our application, the main window will load the content of the LoginPage. 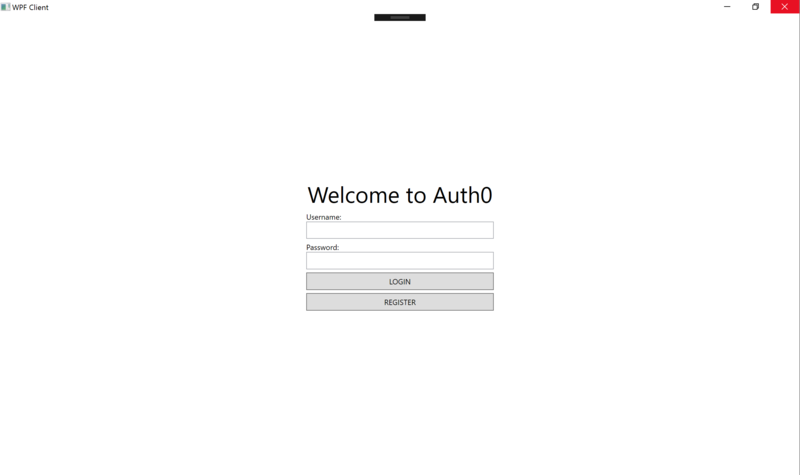 Here, we have two TextBlocks, one TextBox, one PasswordBox and two Buttons for Login and Register simultaneously. Go ahead and create the RegisterPage too just like we created the LoginPage. We have the UI set up. Great! let's add functionality to these forms and buttons. We are using our efficient Csharp-jwt-authentication-sample functional C# Web API backend. Check out the README on how to run it. It can exist in the same top level project directory our desktop app resides but it'll be run as a web app. You might be aware of the MVC/MVVM concept that is popular amongst frameworks. We'll use MVC in our app to allow for clean logic and easy separation of concerns. Here, we need to set up a Data Model for this app. The Model only holds the in-memory state in a structured format. Create the Models directory and add a User Model to the directory. We have the user model with the necessary attributes we need for this app. That's the only model we need. Create an Operations directory and add a new class called ApiOperations. Add the contents below to the class. If the package is not found, it will be downloaded the first time the app is run. Check here for more information on the Newtonsoft.Json nugget. In this AuthenticateUser method, we are taking in the username and password arguments. JsonConvert.SerializeObject converts the username and password to a valid JSON. WebClient is an available class that allows for making web requests easily in .NET. We are using its UploadString method in the try and catch to authenticate a user. If the user exists, it returns details about the user, or else it returns null. This method fetches the user details from the API based on the user id. It takes in the User Model as an argument, then makes a get request using the Webclient DownloadString method. wc.Headers["Authorization"] = access_token sends the access JSON Web Token as the form of authentication. Without this token, we can't retrieve the user details from the WEB API. Every other protected resource will be accessed this way. The Authorization header which contains the key is very important. JWT also provides the ability to do fine-grained access control. You can check here for more information on that. The RegisterUser method takes in all the user details, converts them into a valid JSON with the help of JsonConvert and does a POST request with the help of WebClient.UploadString method. Note: The Content-Type has been set to application/json. With all of that done and out of the way, we'll soon see how everything works together. Let's connect the GUI (WPF) to the Model and ApiOperations class. Open up the RegistrationPage.xaml.cs file. We'll add functionality to the register and back buttons. In the btnReg_Click method, we are obtaining the user's information from the form via the name attributes. Remember tbxUsername, pbxPassword, tbxFirstname, tbxLastname, tbxMiddlename and tbxAge are name attributes we gave the form during the UI setup. Then we called the RegisterUser method from the ApiOperations class we defined earlier. If the user already exists, it gives an error message, otherwise it registers the user and navigates to a new page to show the User details. NavigationService does the navigation. In the btnBack_Click method, the GoBack method of the NavigationService takes the user back to the previous screen. 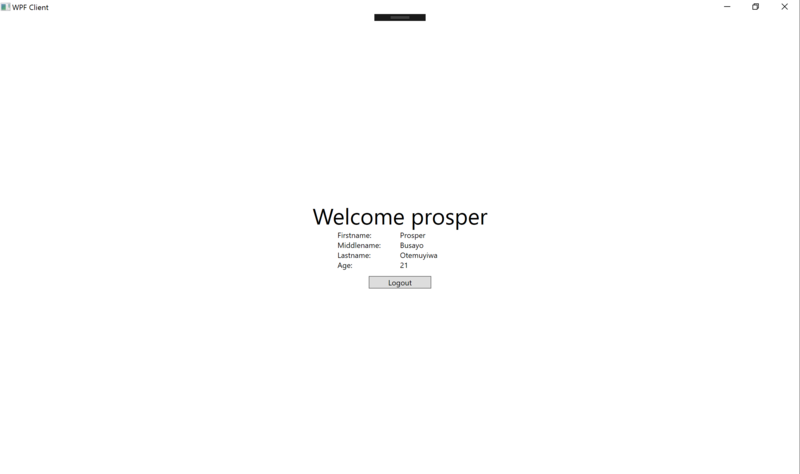 Open up the LoginPage.xaml.cs file. 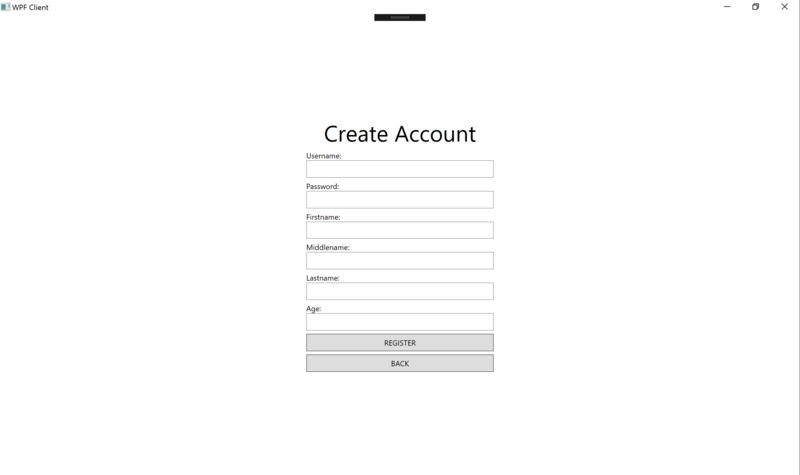 We'll add functionality to the login buttons. 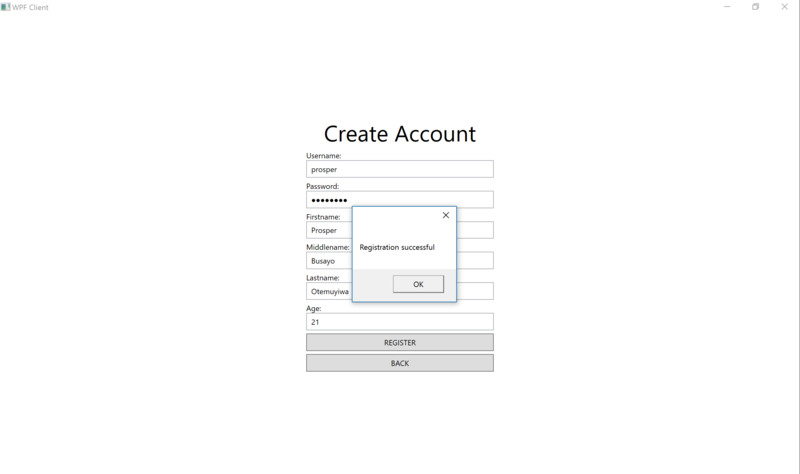 In the btnLogin_Click method, we are obtaining the user's information from the form via the name attributes. Remember tbxUsername, pbxPassword are name attributes we gave the form during the UI setup. Then we call the AuthenticateUser method from the ApiOperations class we defined earlier. If the user doesn't exist, it gives an appropriate Invalid Username or Password message, else logs the user in and navigates to a new page to show the User details. NavigationService does the navigation. You must be wondering what Globals.LoggedInUser = user; is doing there in both the Login and Register Classes. I'll explain in a bit. The Globals Model provides the ability to easily store and retrieve the details of a logged-in user in a structured way. The detailsPage_Loaded method is called once the Page loads up. FetchUserDetails method passes the LoggedInUser model to GetUserDetails method of the ApiOperations class. If it returns null, it means the token has expired else the user info is stored in memory. The token has an expiry date of 1 day. The ShowUserInfo method simply assigns the details to the text field on Details Page. The btnLogout_Click method clears the LoggedInUser Global Model of any data and navigates the user to the login page. 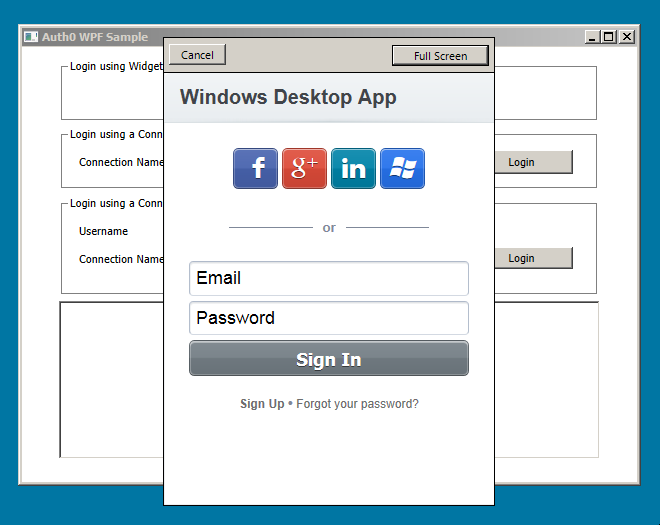 We can easily set up authentication in our native desktop C# apps by using the Lock Widget. Did you expect it to be difficult? Sorry to disappoint you! 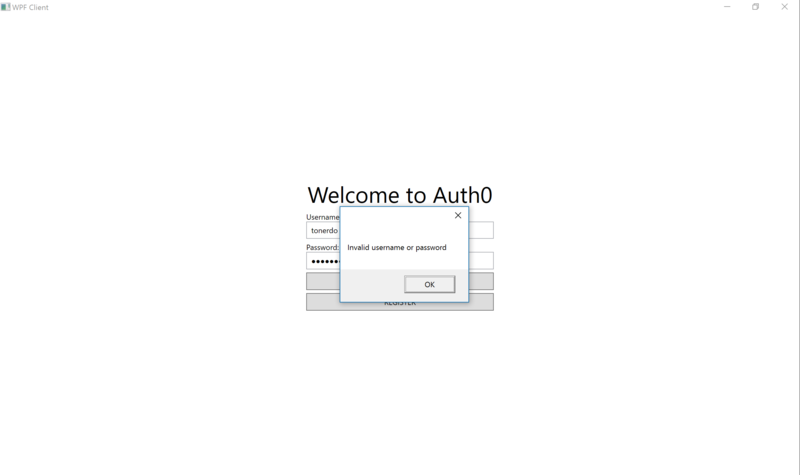 Auth0 Lock Widget is dead simple to use. Visual Studio is a complete IDE, we have witnessed how easy it was to create pages in our desktop app and just add code behind the controls to make it work. C# is a great language to work. If you are coming from a Java background, then you'll sure have the fun time of your life working with it. As we saw in this tutorial, we can easily add authentication to our desktop apps using JWTs. Also, the inbuilt WebClient class makes it trivial to send requests with an Authorization header. "We can easily add authentication to our desktop apps using JWTs."